Upload your resume for us to revise, or fill out our form to give us the information we need to write you a brand-new one. We’ll then match you with one of our professional resume writers. Your writer will overhaul everything in your resume which includes formatting, writing style and keywords. You will have full communication with your writer throughout the process in our easy-to-use dashboard. Most employers use an Applicant Tracking system (ATS) which screens resumes before they’re ever seen by a human. Over 75% of resumes are rejected at this stage because they’re not optimized. In addition to your writer optimizing your resume to pass and score high with these systems, we scan your resume with the same technology to ensure it gets through. Login and Download your new resume! 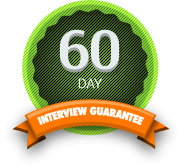 Your new resume is fully protected by our 60-day interview guarantee. If you don’t get more interviews after 60 days, we’ll rewrite your resume-free. to get through applicant tracking systems and impress hiring managers.